For those of you using Common Core, you know about the technology standards and how much pressure there is to help your kids meet all of them (and the mathematics, ELA, and science standards, as well!). I made a diligent effort to incorporate technology through interactive PowerPoints that I designed for individual lessons, Computers as a Literacy Center, watching videos, etc., etc., etc.! I saw my kids becoming independent with technology so the Kindergarten team decided we would utilize the school’s available iPads for an end-of-year research project. The students worked so hard throughout the year to become researchers…and they LOVED it. They would not stay off of fun websites like PebbleGo and Brainpop Jr. even during indoor Recess! We decided as a team that we would have the students research an insect independently and we would use Tellagami to present it to the class. “It’ll be fun!” they said. “The kids will love it!” they said. “We can send the videos home to parents!” they said. That’s all fine and dandy until the Big Kids are utilizing every tiny nook and cranny in the school (including both the regular computer lab and the lab in the library) during their Big Kid State Testing :). Students and teachers all got a major lesson in flexibility at the end of the year, that’s for sure. All donations are tax-deductible for your donors (because it is a charity website). There is an available promo code that your donors can input to match their donation of up to $100 dollar-for-dollar. 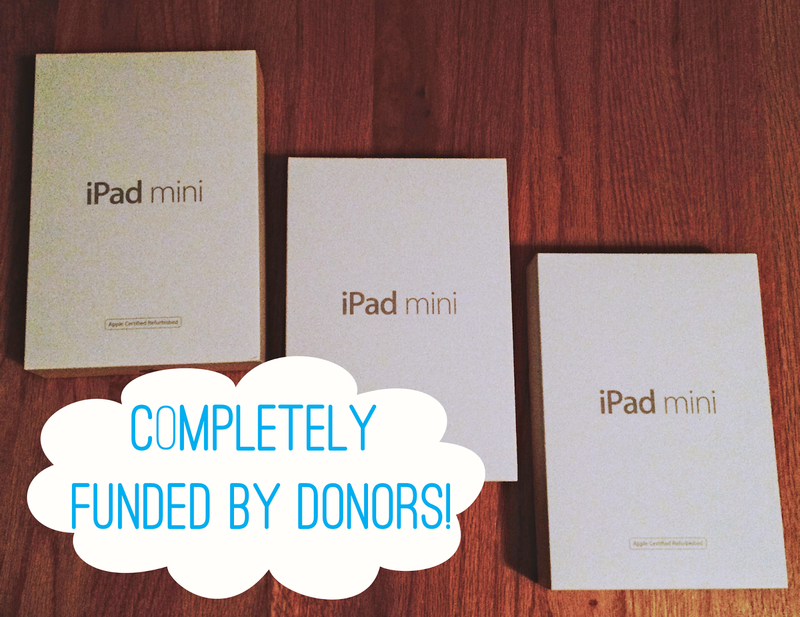 I had a friend have her iPad project become fully funded in only a few days because of this! Keep in mind that this code is only usable for two projects a year. Your donors will all receive a note from you as well as picture updates of your students using the product. The website purchases and ships the product you’ve campaigned for to your school. We all know that our time is limited and sometimes locating the products can take a lot of our valuable time! However, as with any large purchase, check the policies and fine print. You can click here to read about their Material Ownership Policy. Their policy clearly states that the products are yours as long as you meet their criteria. You need only meet a few of their rules so that they can help you out in a BIG way. The policy clearly states you must continue working in a public school in order to continually use their product. That’s fairly doable for most of us. It wasn’t until this next part that I started to get nervous…some districts have rules about donated items. A friend of mine had a lot of paperwork to deal with through our district because she received donated items. Our district has policies that essentially say the donated items belong to the district and not the project owner. She had to have several signatures of approval to ensure her items belonged to her and not the school. Please check your district’s policies before you use this site! Donorschoose wants you to be able to keep the item you campaigned for!! Your project does not have to go through an approval process. I signed up, created, and shared my link to friends and family in about 30 minutes. It does take some time for your project to gain approval to appear in the website’s search function, however. There is no time limit on your project. You could even continue to receive funds after your project completes, unless you choose to close it. You design your own rewards levels. You can see the levels I designed on my page. You know who your audience is..make your rewards appealing to them! You don’t have to wait until the campaign ends to receive your funds. 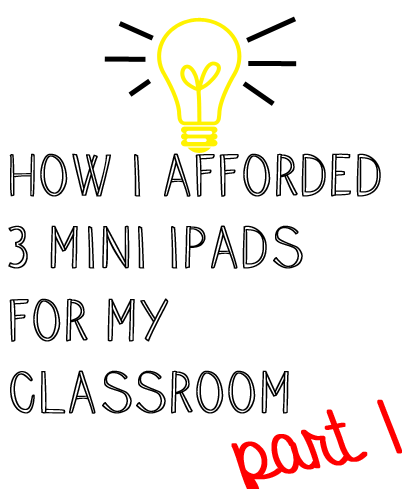 My project is only half-funded and I have already received 3 of my mini iPads and 3 cases because you can opt to have the funds delivered to your account as frequently as you would like. Bear in mind, because the website is free, they get their funds by keeping 5% of every donation and WePay keeps 3% whenever they send it to your bank account. Keep those percentages in mind when setting your funding goal! Because you are receiving the funds, you make the purchase. This means that these will 100% be yours and not the school’s! That is a big seller for many of your donors. They want to know for certainty that their dollars are helping you and your students. Your donors don’t want to feel like they are throwing money at any random Joe in your school! Both websites are great (and free!) options. Use whichever one makes more sense for you! It’s official – I’m a newb.